My current favourite app for creating digital stories is ToonToolKit. You may have noticed I used it in Activities for Children’s Book Week 2014. It took me a little while to warm up to ToonToolkit as it has quite a lot of detail, but after a couple of tries, everything clicked for me. ToonToolkit lets you create cartoon strips on your iPhone or iPod touch. There's a set of characters in different poses and a bunch of things for them to play with, all drawn by a professional cartoonist. You can add text, thinks and speaks bubbles, change the layout, and save your finished strips. And when you're done drawing you can upload your strips to TwitPic and post a Tweet to Twitter, save them to your Photos library or put them onto the clipboard so you can paste them into Mail messages. What I like: John A. Abbott’s art work is very appealing. There are no fancy backgrounds, just white, and that really sets the colour scheme off. As a professional cartoonist, Abbott brings a quirky humour and style to the characters provided. There are several different characters and lots of props to choose from, with more available for purchase. I also like that a finished toon is saved to the iPad's camera roll. Some parts of the toon-making process are a little fiddly. Luckily, there are comprehensive written explanations for all the steps involved. Like any app, the more you try it, the easier it gets. I hope additional art work will be forthcoming. I would also love it if there were an option to have templates with less/more than three panels. 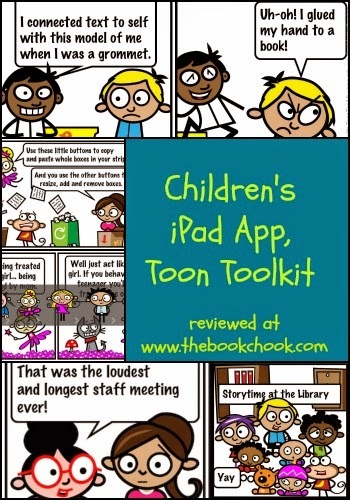 ToonToolKit could certainly be used by older primary/elementary aged students upwards to tell a digital story. I think they will enjoy the range of characters and the different poses available in each character. Consider using it with your students if they need to get a message across with more than words, or if your kids are looking for a new way to engage with an audience. Using a couple of panels and speech bubbles to tell a concise story is a wonderful way to engage children with writing. They also learn lots about visual and digital literacy during the process, and best of all, have the chance to express themselves creatively. It’s also a useful tool for teachers who want to add a little visual magic to the classroom, or share a message with colleagues!